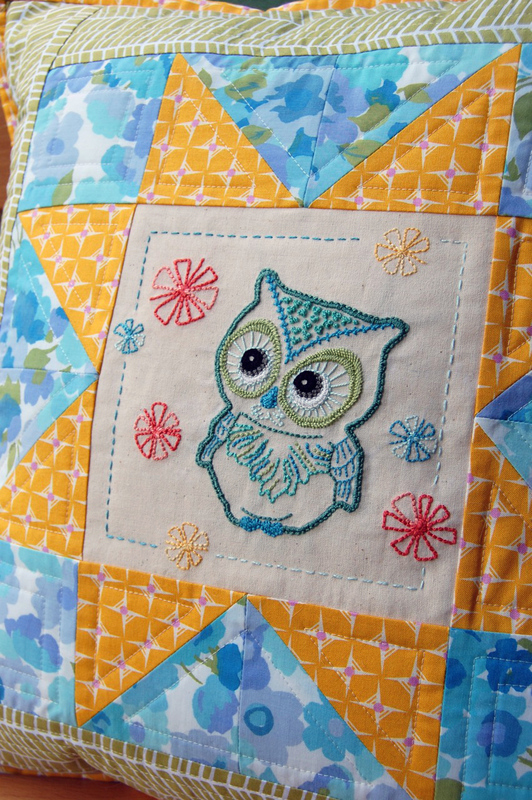 A little while ago we featured this adorable owl on our blog and now Jenelle of Echinops & Aster has made an incredibly cute cushion pattern based on her original stitched piece! 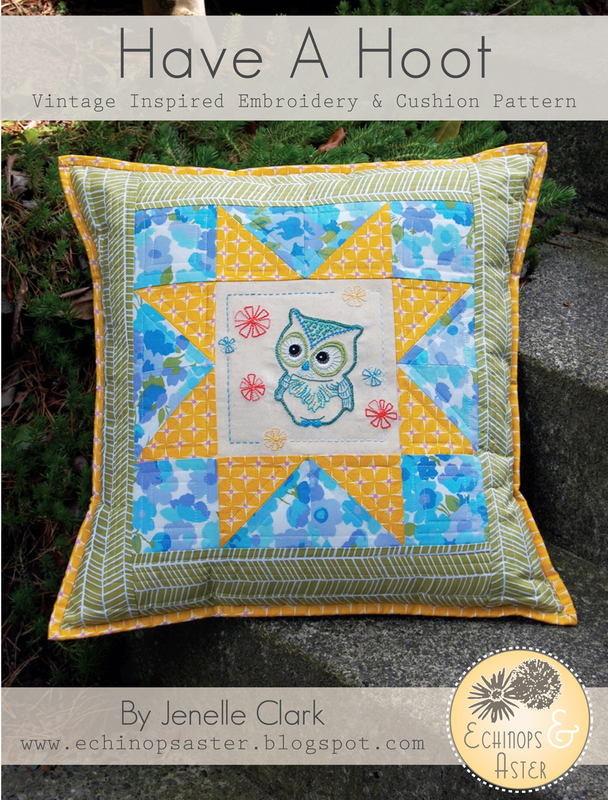 The 16 page pattern is called Have A Hoot and includes instructions for both the embroidery and the pillow, as well as further stitch suggestions. 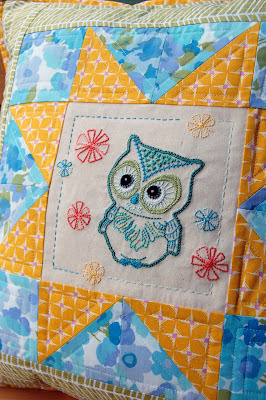 We are giving away one of Jenelle's Have A Hoot PDF patterns to a lucky reader! Leave a comment on this post before Monday the 6th of August 12.00 AM (Central European Time) and be sure to leave your email address or some other way we can contact you! Please tell us in the comments what you think would be a fun theme for an upcoming issue of &Stitches! So far we've had the following themes: Colour, Books and Oriental Inspirations. And if you can't wait to get your hands on this lovely Have a Hoot pattern, why not visit Jenelle's shop here. How about pets? Maybe cat patterns? BUGS! I have been seeing so many amazing insect pieces lately. I would love to see a theme of "Combinations"- something along the lines of combining different patterns, or different yarn types, or different techniques or different styles! And, that owl is totally adorable! And, while the thought of a patchwork quilts gives me nightmares, I could certainly handle a pillow. Thanks for the chance to win the pattern! Kittens and bunnies! Odd combination? Sure, but both are way cute! i'd like to see a theme of vintage designs used in modern ways. thanks for the giveaway! I LOVE Owls SO much!!! Vintage forest animals-owls, deer, bears, ect. As far as future themes go... how about birds or flowers? That is just the cutest baby owl! How about some embellished capital letters for initials?! or... what about autumnal things like leaves, mushrooms, pumpkins and acorns? uh, I'm also thinking about embroidered alphabets in these days! How cute! Just found your blog and really like it. I would like to see fairy tale inspired stitches.Thanks! What a cute pattern! A fun theme..kittens and puppies. Retro designs that have been modernized. Love this pillow! Anything animals! Thank you for a chance to win. Love it! My son loves owls! I have made two cross stitches and a jenaissance design embroidery for his room! Love the pillow! Christmas theme?? Houses of all sorts would be my suggestion. I haven't seen the "books" theme and will have to go check it out--that's something I would love, love, love. i would love to win this!!! speaking of the pillow - an issue on hand embroidery with really great instructions for the beginner would be great - or something on foundation piecing as well - with cute blocks! How about little girl's theme? such as small dresses, hats, ribbons, dolls etc? A good theme would be birds! I love birds and think they have a great quality for stitching. Thanks for the great giveaway ~ love that little owl. I think a good theme would be animals. I love seeing stitched animals of all different types, especially with a vintage feel. AWESOME! This would be a GREAT addition to my embroydery (can't spell this morning apparently) obsession! How about wild flowers for the next theme? I love this pattern. The owl is the most adorable little owl I've ever seen. Themes ~ baby or kittens/puppies would be great. Everyone knows someone that has had recently or is going to have a baby and needs to make gifts. Let's see... What about Sailor Jerry? You could do old-fashioned tattoo inspired stitching with pin ups and WWII insignia. Could be fun. How about "Stitching Decades" theme? I love the way design has changed throughout the years. How adorable! I would love to win this pattern so I can make this for my new granddaughter expected to arrive in September. I think I'm too late for the giveaway but what a super cute pillow!